May 25, 2017 – Astronomers have watched as a massive, dying star was likely reborn as a black hole. It took the combined power of the Large Binocular Telescope (LBT), and NASA’s Hubble and Spitzer space telescopes to go looking for remnants of the vanquished star, only to find that it disappeared out of sight. The star, which was 25 times as massive as our sun, should have exploded in a very bright supernova. Instead, it fizzled out — and then left behind a black hole. As many as 30 percent of such stars, it seems, may quietly collapse into black holes –no supernova required. He leads a team of astronomers who published their latest results in the Monthly Notices of the Royal Astronomical Society. Among the galaxies they’ve been watching is NGC 6946, a spiral galaxy 22 million light-years away that is nicknamed the “Fireworks Galaxy” because supernovae frequently happen there — indeed, SN 2017eaw, discovered on May 14th, is shining near maximum brightness now. Starting in 2009, one particular star, named N6946-BH1, began to brighten weakly. By 2015, it appeared to have winked out of existence. 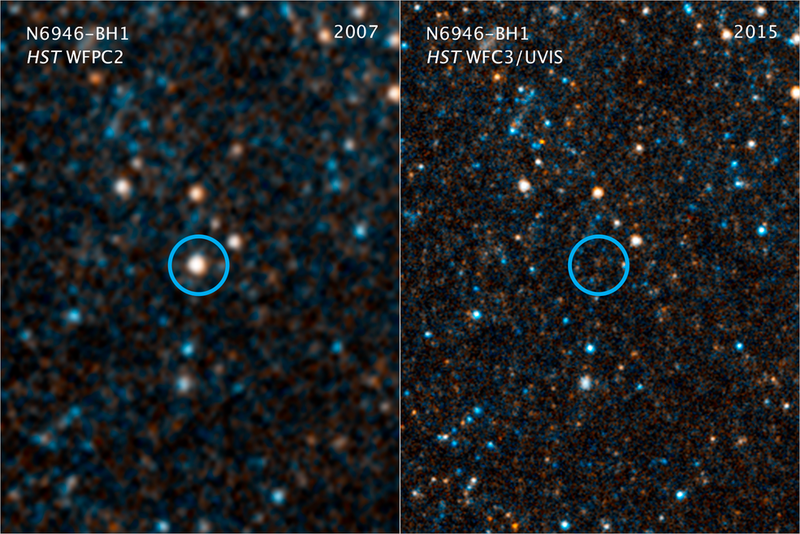 After the LBT survey for failed supernovas turned up the star, astronomers aimed the Hubble and Spitzer space telescopes to see if it was still there but merely dimmed. They also used Spitzer to search for any infrared radiation emanating from the spot. That would have been a sign that the star was still present, but perhaps just hidden behind a dust cloud. It doesn’t necessarily make sense, said Stanek, professor of astronomy at Ohio State, that a massive star could undergo a supernova — a process which entails blowing off much of its outer layers — and still have enough mass left over to form a massive black hole on the scale of those that LIGO detected. “I suspect it’s much easier to make a very massive black hole if there is no supernova,” Stanek concluded. Adams is now an astrophysicist at Caltech in Pasadena, California. Other co-authors were Ohio State doctoral student Jill Gerke and University of Oklahoma astronomer Xinyu Dai. Their research was supported by the National Science Foundation. NASA’s Jet Propulsion Laboratory in Pasadena, California, manages the Spitzer Space Telescope mission for NASA’s Science Mission Directorate, Washington. Science operations are conducted at the Spitzer Science Center at Caltech. Spacecraft operations are based at Lockheed Martin Space Systems Company, Littleton, Colorado. Data are archived at the Infrared Science Archive housed at the Infrared Processing and Analysis Center at Caltech. Caltech manages JPL for NASA. The Large Binocular Telescope is an international collaboration among institutions in the United Sates, Italy and Germany. The Hubble Space Telescope is a project of international cooperation between NASA and ESA (European Space Agency). NASA’s Goddard Space Flight Center in Greenbelt, Maryland, manages the telescope. The Space Telescope Science Institute in Baltimore, conducts Hubble science operations. STScI is operated for NASA by the Association of Universities for Research in Astronomy, Inc., in Washington.